Whether you show your horse in dressage or barrel racing, you should take care of your horse’s hooves. By properly maintaining your horse’s feet, you will be able to catch any minor issues before it becomes a health problem for your horse. 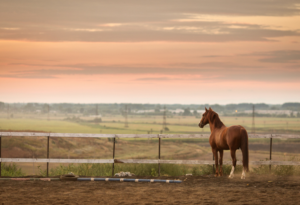 Below are three simple things you can regularly do to help keep your horse healthy and happy. Pick Your Horse’s Hooves Regularly- This might seem obvious, but many people do not realize that they can avoid problems by catching it early. By picking their hooves often, you are making sure there are no stones or manure stuck in their hooves. Regular Farrier Appointments- Every horse is different, which is why it is essential to listen to your farrier’s recommendation for your next appointment. Typically it is every 6 to 8 weeks. Diet/Exercise- With consistent exercise and diet, you can help your horse have healthier hooves. You should consult with your vet about changing your horse’s diet. With regular maintenance, your horse can have happy hooves. If you are looking for horse insurance, you can turn to Ark Agency for different types of insurance. We carry horse mortality, horse medical, and horse loss of use for your convenience. Give us a call at (800) 328-8894 for additional information about our horse insurance policies.